The scientific demonstration came with a warning. Instead, Hayden Brown, 10, of Culpeper punched his fist in the air and declared, “I’m gonna torch this thing,” as he and teammates set out to build a stove. Dillon equipped children with alcohol and razor blades, tin cans and wire cutters on Saturday, all in the name of science. It was part of “Science & Engineering LIVE,” an interactive STEM (Science, Technology, Engineering and Math) demonstration hosted by the Dahlgren Heritage Museum. The museum is open on the third Saturday of each month, in the former visitors center off U.S. 301 near the Harry Nice Bridge. Museum officials try to hold special events on those Saturdays, especially STEM activities, which are a logical connection between the museum and the Navy base at Dahlgren, said Susan Prien, museum administrator. “We want to get kids really excited about engineering, and hopefully they’ll work there [at the base] one day,” she said. Dillon, a computer scientist from Dahlgren, brought three physicists with him and instructions on how to build two types of stoves. He told the nine students around him, who ranged in age from 8 to 15, that he was interested in the stoves because he’s planning to do some hiking on the Appalachian Trail. Both the rocket stove and mini alcohol stove are lightweight, easy to assemble and fit perfectly in a backpack, he said. He showed the students the plans for each and explained how energy, fuel sources and atmospheric pressure would come into play. Then he pointed to the needed tools and encouraged them to get to work. The two boys and two girls building the rocket stove out of tin cans of various sizes, set about drilling holes and flattening cans. The five girls working on the alcohol stove needed some encouragement, especially after Cierra Banks, 15, of Culpeper cut her finger on the sharp edge of a soda can that she was trimming with a razor blade. Dillon was glad the fellow Dahlgrenites he invited were schooled in other skills besides physics. Dan Freeman, an emergency medical technician in Colonial Beach, brought his first-aid kit and got out alcoholic wipes and Band–Aids. Patrick Moneyhon, a volunteer firefighter in King George, had a fire extinguisher, but thankfully didn’t need it. The teams worked for the better part of an hour, trimming, shaping and assembling their stoves. As Lynn Banks of Culpeper watched her children and others work, she said the design was similar to concepts she had used to cook outside while camping with Girl Scouts. Her children’s great-uncle, Clifton Samuels, was one of the first engineers at the Navy base at Dahlgren and worked there for 44 years. Now 93, he and his wife, Margaret, watched the STEM events with interest on Saturday. The rocket stove, which looked like an old-time cook stove, was fueled with wood kindling. It fired right up, and smoke rolled from the chimney within seconds. The much smaller alcohol stove was made of pieces from two soda cans that had been wedged together, one on top of the other. Emma Hickey, 11, of Spotsylvania County used a thumbtack to pierce small holes in the top piece, and after alcohol was poured into the stove, a ring of fire was supposed to form at the top. But the stove didn’t cooperate. After the kids used a half-dozen matches and still couldn’t light it, Moneyhun hovered over it until he produced flames. Hayden, perhaps hearkening to his inner caveman, wanted to try the rocket stove at home. “I’m gonna roast some hot dogs over it,” he said. 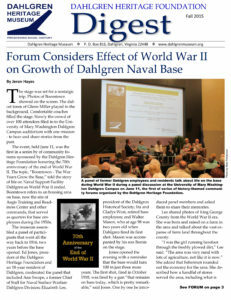 More information about the Dahlgren Heritage Museum is available at dahlgrenmuseum.org. The Dahlgren Heritage Foundation is a 501c3 non-profit organization. Your tax deductible donation will help us tell the extraordinary story of the Navy at Dahlgren and its contributions to our community and our freedom!